CM Magazine: Halifax Explodes! (Canadian Flyer Adventures, No. 17). Halifax Explodes! (Canadian Flyer Adventures, No. 17). Frieda Wishinsky. Illustrated by Patricia Lewis-MacDougall. Toronto, ON: Maple Tree/Owlkids, 2011. 73 pp., pbk. & hc., $7.95 (pbk. ), $17.95 (hc.). ISBN 978-1-926818-98-6 (pbk. ), ISBN 978-1-926818-97-9 (hc.). 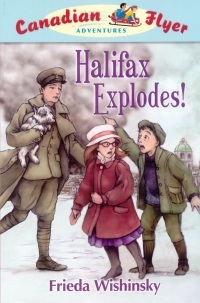 Halifax Explosion, Halifax, N.S., 1917- - Juvenile fiction. Tim and Matt turned around. "I tripped over some of the rubble, but I'm fine. Let's keep going," said Emily. Soon they could see the little park. Tree branches had toppled over on bushes. Benches were broken. It was a jungle of twigs and branches. "Wait," said Matt. "I hear something. "H-here," said a small voice. "Carolyn!" shouted Tim. "Is that you? Tell us where you are." "Where are you?" asked Tim, looking around. "I can't see you. Can you describe where you are? "Hurry...please," was the only response. "What do we do now?" asked Matt. Emily Bing and Matt Martinez never get bored because they have the ability to travel back in time. All these curious friends know before they leave comes from a clue they pull out of a dresser drawer. Halifax Explodes! concludes the "Canadian Flyer Adventures" series. This story takes the friends from present day Ontario to Halifax, NS, as it was on December 6, 1917, after the explosion caused by two ships colliding in the harbor. 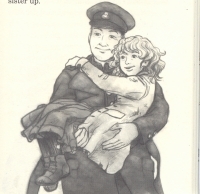 With the help of a lost dog named Poppy, Matt and Emily are able to reunite a soldier with his young sister. As they follow the route she last walked, they experience, first-hand, the effects the explosion had on families and businesses in the area. The magic sled, which is usually hidden on these adventures, is used in this story as transportation during a rescue. Keeping their true identifies hidden is always a concern for Matt and Emily, but this time, they have reason to be worried since they meet someone they talked to on a previous time travel adventure. This fast paced story has a delayed happy ending though because the sled that usually takes Matt and Emily home goes missing. Boys and girls looking for stories about Canada's past can read these books as standalones. Each book concludes with detailed facts about an important time in Canada's past and an interview with the author about her research. Black and white illustrations replicate details described in the story.